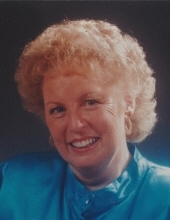 A Bardstown resident, Mrs. Barbara Case Schlenker age 80 passes away Sunday, March 24, 2019 at her residence. She was born on June 19, 1938 in Anderson County to the late Arthur and Martha Sea Grubbs. Barbara was a former employee of Ford Motor Company and was a member of Bardstown Baptist Church, Bardstown American Legion Post #121 Ladies Auxiliary. Besides her parents she was preceded in death by her husband, Edwin Schlenker, a son, Mike Case, a sister, Judy Goodlett, 2 brothers, Coy and Curtis Grubbs. She is survived by 2 daughters, Kathy Case of Bardstown, Donna Conway (Tony Foreman) of Bardstown, 1 brother, Billy (Libby) Grubbs of Richmond, 3 grandchildren, Amy Burgan of Bardstown, Tech SGT Clint (Jodi) Downs of Iowa Park, Texas, Marc (Eden) Nethery of Shelbyville along with 7 great grandchildren. Funeral services for Mrs. Barbara Schlenker will be 11:00am, Friday, March 29, 2019 at the Houghlin-Greenwell Funeral Home with Bro. Doug Simpson officiating. Interment will be in Cox’s Creek Baptist Church Cemetery. Visitation will be Thursday from 3:00-8:00pm at the Houghlin Greenwell Funeral Home, 1475 New Shepherdsville Rd., who is in charge of arrangements. To send flowers or a remembrance gift to the family of Barbara Case Schlenker, please visit our Tribute Store. "Email Address" would like to share the life celebration of Barbara Case Schlenker. Click on the "link" to go to share a favorite memory or leave a condolence message for the family.